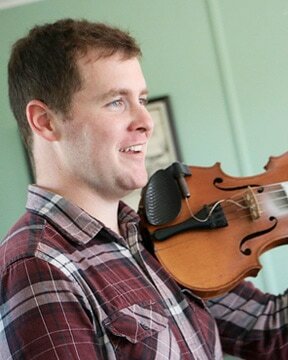 Kyle MacDonald from Foot Cape, Cape Breton grew up surrounded by a community of fantastic fiddle players. As a youth he spent many hours with the late Dougie MacDonald and performed widely on the Island with his two brothers, (Keith and Colin) calling themselves “All Fired Up”. His development as a fiddler benefited from his early age affiliation with the Cape Breton Fiddler’s Association, and he was lucky to have experiences learning from players such as Ed Rogers, John Campbell, Stan Chapman, Jerry Holland, Carl MacKenzie, David Greenburg, Winnie Chafe, and Buddy MacMaster. Marianne Jewel instructed Kyle throughout his teen years deciphering the Gaelic style of fiddle playing local to the Mabou area. It was during this time that he gained confident literacy in note reading, and developed his playing in a variety of key signatures. Kyle attended St. Francis Xavier University where he attained a Bachelor of Arts with a Major in Music ‘11, and a Bachelor of Education ’13 and has spent the past two years living in Halifax. In January 2015, he was asked by the Aurora Fiddle Society to travel to Yellowknife, NWT and instruct their Winter Workshop, having the honor of being the first Cape Breton Fiddler asked to do so. He is quick to name Cameron Chisholm, John Morris Rankin, Willie Kennedy and Buddy MacMaster as fiddlers he enjoys listening to as well as Howie MacDonald, Rachel Davis, Kenneth MacKenzie, and Ian MacDougall. Kyle recently moved back to the town of Inverness.